We bake a variety of delicious breads to meet your special needs and tastes. 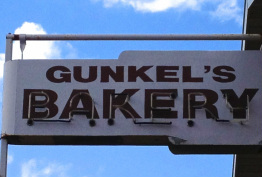 Since 1995 we have been baking our tasty Flax Seed breads the old German way-baking with steam in the ovens. Each loaf takes well over four hours from start to finish. Call us toll free at 1-800-325-3062 or directly at (715) 623-4019 to place your order. Shipping is always available and is based on weight. Description: OUR CRACKED NATURAL WHEAT FLAX BREAD HAS AN INCREDIBLE NATURAL FLAVOR. PLUS, IT'S GOOD FOR YOU! Description: IF YOU ARE LOOKING FOR A GOOD-TASTING, NUTRITIOUS RYE BREAD, THIS BREAD WILL MEET YOUR NEEDS, AND THEN SOME. THIS IS A TRUE RYE-BREAD LOVERS TREAT. Description: OUR CRANBERRY NUT BREAD FLAX BREAD IS MADE FROM THE FRESHEST CRANBERRIES AND WALNUTS. ITS GREAT TASTING AND TOASTS INCREDIBLY WELL. IT HAS A SHELF LIFE OF EIGHT TO TEN DAYS. Creamy Crust Flax - The most popular and best-selling bread in our bakery! Description: THIS BREAD HAS A NICE, WHOLE GRAIN FLAVOR. SUNFLOWER SEEDS ARE USED FOR FLAVOR AND TASTE. IT'S VERY LOW IN CARBOHYDRATES. THE SHELF LIFE IS EIGHT TO TEN DAYS. Honey Wheat-N-Flax - Our best-selling wheat bread! Description: OUR HONEY WHEAT - N - FLAX BREAD HAS A FULL WHEAT TASTE AND SMELL. PURE WISCONSIN HONEY IS USED, WITH CLOVER BEING THE FLOWER OF CHOICE FOR THE BEES. THIS BREAD TOASTS VERY WELL AND HAS A SHELF LIFE OF EIGHT TO TEN DAYS. Description: THIS BREAD CONTAINS AS MUCH CALCIUM AS A GLASS OF MILK. A GREAT WAY TO KEEP BONES HEALTHY AND MAINTAIN A TRIM FIGURE. IT TASTES GREAT IN SANDWICHES OR WHEN TOASTED. BEST WHEN KEPT FROZEN AFTER OPENING. USE ONLY WHAT YOU NEED FOR EACH SERVING SITUATION. Description: IF YOU ARE LOOKING FOR A GOOD-TASTING, NUTRITIOUS RAISIN BREAD, THIS BREAD WILL SATISFY YOUR NEEDS. THIS IS A TRUE RAISIN-LOVERS TREAT. Description: THIS EXCELLENT BREAD IS FILLED WITH GREAT-TASTING SESAME SEEDS. THIS IS A TRUE SESAME BREAD- LOVERS DELIGHT. Description: IF YOU ARE LOOKING FOR A BREAD THAT WILL HELP YOU KEEP YOUR ENERGY LEVEL UP, THIS BREAD IS FOR YOU. IT IS SPECIALLY FORTIFIED WITH VITAMINS AND MINERALS. IT MAKES GREAT TOAST, AND IS PERFECT FOR THOSE PICK-ME-UP TIMES OF THE DAY. Description: PHIL SPENT MONTHS EXPERIMENTING WITH VARIOUS INGREDIENTS TO COME UP WITH A BREAD FOR THE SERIOUS HEALTH-CONSCIOUS INDIVIDUAL. THIS OATMEAL FLAX BREAD IS LOADED WITH SPECIAL INGREDIENTS DESIGNED TO MAINTAIN GOOD HEALTH, OR ASSIST WITH ACHIEVING IT. Description: THIS BREAD HAS THE UNIQUE FEATURE OF HAVING SOFTNESS WITHOUT ADDING DOUGH CONDITIONERS. THIS MEANS THE BREAD IS MORE NATURAL IN ITS DOUGH DEVELOPMENT AND IS LESS EXPENSIVE TO PRODUCE, MAKING IT LESS EXPENSIVE FOR YOU WITHOUT SACRIFICING TASTE. THOUGH NATURALLY SOFT, IT STILL MAKES GREAT-TASING TOAST OVER ITS EIGHT TO TEN DAY SHELF LIFE. Description: PHIL SPENT MONTHS EXPERIMENTING WITH VARIOUS INGREDIENTS TO COME UP WITH A BREAD FOR THE SERIOUS HEALTH-CONSCIOUS INDIVIDUAL AND NOW HAS ADDED TO IT WITH CRANBERRIES, NUTS, AND BLUEBERRIES. THIS OATMEAL FLAX BREAD IS LOADED WITH SPECIAL INGREDIENTS DESIGNED TO MAINTAIN GOOD HEALTH, OR ASSIST WITH ACHIEVING IT. Description: PHIL SPENT MONTHS EXPERIMENTING WITH VARIOUS INGREDIENTS TO COME UP WITH A BREAD FOR THE SERIOUS HEALTH-CONSCIOUS INDIVIDUAL AND NOW HAS ADDED IT WITH CINNAMON AND RAISINS. THIS OATMEAL FLAX BREAD IS LOADED WITH SPECIAL INGREDIENTS DESIGNED TO MAINTAIN GOOD HEALTH, OR ASSIST WITH ACHIEVING IT. Description: TRY THIS UNIQUE BREAD THAT IS A TASTY COMPLEMENT TO ANY SANDWICH.